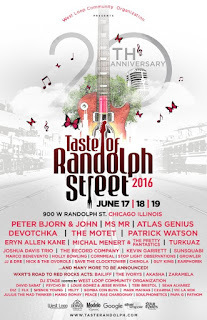 Chicago - April 1st, 2016 - StarEvents, the West Loop Community Organization, and Silver Wrapper have shared the Music and Restaurant Lineup for Taste of Randolph Festival 2016 Friday June 17th thru Sunday June 19th. Commemorating the iconic street festival's 20th Anniversary, StarEvents and WLCO brings together the biggest and brightest names in Chicago dining, featuring over 20 restaurants exemplary for delectable menus and irresistibly unique flavors. 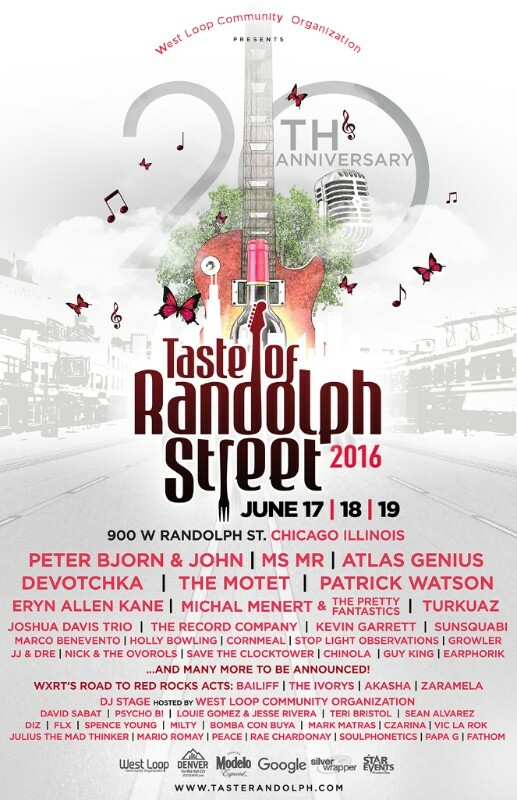 Taste of Randolph features a musical lineup of legendary headliners and rising stars, as well as the biggest names in Chicago house music, performing on two stages and a DJ stage, to entertain guests on their culinary adventure. Fest guests can enjoy Taste of Randolph in style! The VIP ticket package includes VIP lounges, reserved concert seating, private bathrooms, and beer discounts. Taste of Randolph benefits the West Loop Community Organization, which has been advocating for the West Loop neighborhood since 1991, supporting local businesses and economic development.